We took a short trip to Guangzhou, just over a weekend. Guangzhou was (and is) a blank spot for us, all we knew was that it is know as Canton and that it is the the capital of the Guangdong (Canton) province. The urban area has a population of 11 million, more than Sweden. We took a train from Hung Hom, a railway station on the south tip of Kowloon. Pretty early, for us. Boring waiting room at Hung Hom railway station. 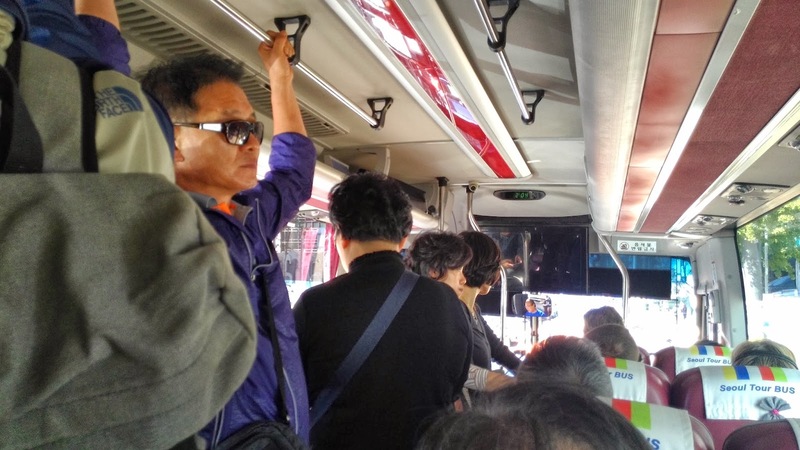 It is just a two hour ride from Hung Hom to Guangzhou, and the ride was pretty uneventful. We had been warned about the Guangzhou East railway station, high risk of pickpockets and/or mugging, so we took the fastest route we saw out if the building. Our worries dissipated fast, IKEA is there to keep us safe! IKEA - a soothing sight for Swedes on traveling foot. Our hotel was five km from the station, straight south, so we took aim at the Canton Tower and set off. We didn't really know what to expect, but were surprised never the less. This part of Guangzhou is called the New City and is brand spanking new. Very modern architecture surrounded well designed parks and large open areas for people. Lots and lots of greenery! turned out to be a underground shopping mall. Growing more and more hungry, we became desperate for a restaurant with English menus. Eventually, we found Buddy's Bistro, what looked like a greasy spoon joint. But we could read the menu (maybe not understand it, though). So we ordered some noodle, a pork chop bun, some dumplings, and some stir fried broccoli with fermented bean curd. They got most of it right. And the food was really good! Surprise number 2. We reached the hotel, way much more fancy that we had thought (surprise #3). The room was almost as big as our apartment with a generous king size, sofa, desk, and a bathroom that had everything. Including a TV. The evening came and the view from our hotel windows turned spectacular! We had Canton Tower in full view and it had a light show that was mesmerizing. Ever changing lights on Canton Tower. Armed with the name and address for a seafood restaurant, we went out in the night. More lights. More colors. More. Lights around the park in the middle of New City. We grabbed a cab, gave the cabbie the address and went for a twenty minute ride to a place just by the river with lots of restaurants, bars, and clubs. 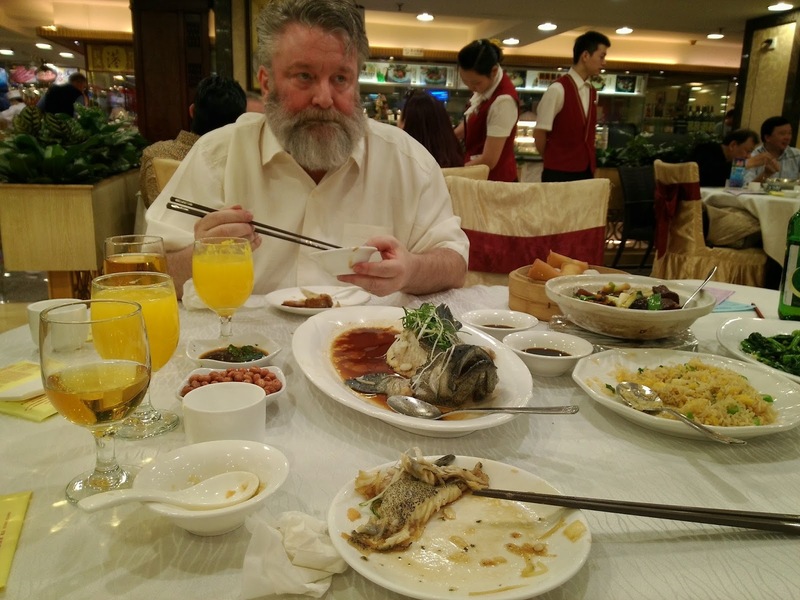 Here was the Guang Zhou Hong Xing Seafood Restaurant. English was a problem here, just as at Buddy's Bistro, but they wrangled up two happy boys who did their best, and did fine. This was one of the gigantic Chinese restaurants that probably had room for a thousand seated guest. And a massive staff running around serving the guests. Yvonne wanted steamed fish, so she went off with one of the boys to all the fish tanks with live fish to decide which fish she wanted. And we order some more. Just a little. Some fried rice with seafood (most certainly the best we ever had, ever), some dumpling (ah, these little bundles of exquisite and subtle taste), a few deep fried seafood spring rolls (deep fried = good), some braised pork belly with abalone (pork belly = good, abalone = good, together very good), water cress stir fried with garlic (garlic anything is good). Unfortunately, the portions were quite a lot larger than they are in Hong Kong, so we ended up eating only half of what we ordered. Half way through and we're already stuffed. A stroll along the river got us out of the food induced coma. They love their lights and colors in Guangzhou. A cab took us back. Cabs are cheap in Guangzhou: A twenty minutes ride cost us just over US$ 3. The hotel wanted US$ 40 for their buffet breakfast. We didn't want to pay that. So we had a light breakfast at our room. Worked just fine, thank you! Bagels with scrambled eggs, smoked salmon plus fresh fruits and tea. Sunday was spent mostly on Canton Tower. The highest observation deck is 488 m above ground, the highest we have ever been in a building. The view is great, albeit restricted by the hazy smog. You had to pay extra to get to the topmost deck. Money well spent, as we got our own security detail following us around. What surprised (surprise #4) us when looking at Guangzhou from above was all the parks. Any direction you look, you see more than one park. corner, the library in the lower right hand corner and a sports arena in the middle. As a Swede, you know that you should never, ever eat at tourist attractions like the highest building in town. But we gave the Chinese restaurant Color on 103rd floor a chance. Surprise #5: Excellent Dim Sum! Dim Sum on 103rd floor. We took the APM (Automatic People Mover) back towards the railway station and walked along the marvelous park in the middle of New City. Winding paths, small streams, benches, calm and serene. Calm, serene, and anything but crowded. It was now that we realized that all the parks we walked through, and all the vast open areas for people to mill around in where actually the roofs of vast, multi-storey, underground malls. Surprise #6. We sauntered through one of them, just one floor, before it was time to head for the railway station and our ride home. We know that we have only seen a very small part of Guangzhou, but we really liked what we saw. All we came in contact with were extremely polite and helpful. Language is an issue, as English isn't commonly known, and we don't speak neither Mandarin nor Cantonese, alas. But we want to go back. More than once. One of the benefits of living in Hong Kong is all the exciting places you can go to over weekends. We actually have quite a list of places we would like to go to while being here, categorized by climate. The past weekend we had picked Seoul, mostly because it soon will be too cold to go there. Neither of us had ever been to South Korea, so we tried to read up on what to do before going. But we still got something of a culture shock. It is quite different from Hong Kong. Just a few speak English, and those who do, do it quite poorly. Road signs are few and far between, and often only in Korean. The so called English menus are in Korean, but with the dishes names transliterated to the Latin alphabet. It doesn't help me to know that the it is call "BongChu", I still don't know what it is. But this is one of the delights with travelling, to take leaps of faith now and then. First night, we took a stroll along a nice little stream. Someone had told us about it. Thank you, someone! We ended up in an area of hectic nightlife called Gyongpyeong-Dong. Lots of restaurants and bars, lots of Koreans, few westerners. We dropped in at a place with "English menus" and ordered a pork dish, "not spicy, only medium spicy" the waiter said. Yea, like sure it was. Hot, but very, very good! We also tried Soju, a Korean rice wine. Not overly impressed. Saturday started with a hop-on-hop-off around the city bus tour. We like going on one of these when we come to a new town. They often give you a nice feel for the surroundings and are often good value for money. But not so here! The buss was full from start (we lived just by the starting point), but kept picking up more and more people along the route. Soon the aisle was filled to capacity, and most of the passengers were unable to listen to the commentaries available to the seated passengers. But that didn't mean so much of a difference, since the ones seated couldn't hear much of the commentary either. The on-board guide had a knack of only speaking while the commentaries were rolling, effectively making both himself and the commentary inaudible. The rest of Saturday was spent shopping. Or at least trying to shop. More walking than shopping. Definitely more walking than shopping. The Koreans are polite people, at least in comparison with the Chinese. Even young friends bow to each other when meeting, staff at restaurants and other places are very friendly in a polite way. And they seem to appreciate being treated politely. The city is also very neat and clean, maybe not compared to Singapore, but still. At least the very small part we visited. 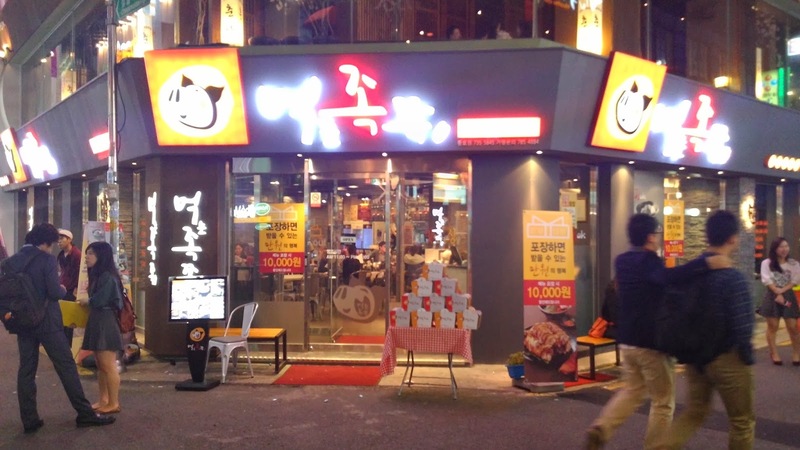 We had heard about a good, modern Korean restaurant, not so far from the hotel. The Top Cloud at 33rd floor of Jongno Tower. 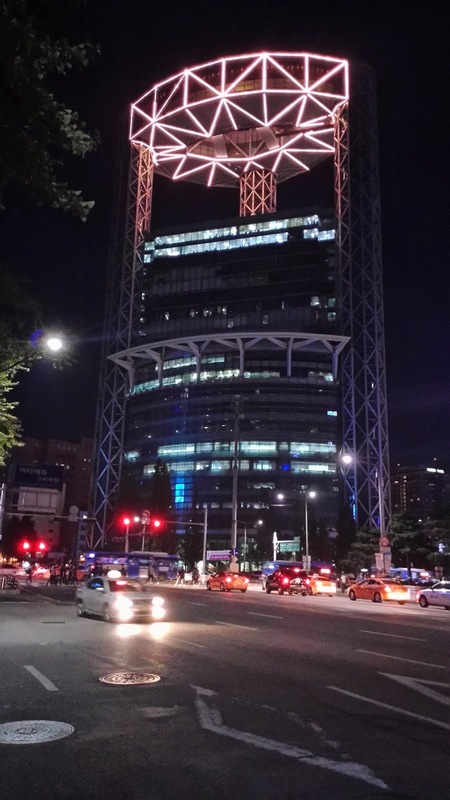 We kind of guessed which house would be the Jongno Tower, but when we got close to it, we saw no trace at all of any restaurant. After looking around, we decided to ask the receptionist in the ginormous lobby on the ground floor of what we thought was the tower. Yupp, we were at the right place, just take the elevator. Not until we were at the elevator did we see a sign for the restaurant. Impossible to see from the street. Oh, well. The restaurant turned out to be French. And not just French, Guide Michelin Star wannabe French. But what the heck! Let's go French tonight! And we did. Eight courses and three wines later, all at a fantastic view of the city night, we didn't regret a thing. Non, je ne regrette rien! Sunday was spent touristing. Went to a Hanok, a traditional village in the middle of the city. Like a Korean Skansen. Nice, but a little bit too simplified. Seoul Tower was next. Took the cable car up the hill, which was a good move. We wouldn't have made it walking. Went to the top of the tower. A good view of the sprawling city. A little like LA, a lot of low houses, with some high-rises here and there. It's a big city. Some 22 million people in the urban area. 2.5 times the population of Sweden. In one city. Dinner at a place that had just one dish on the menu, BongChu, braised chicken. You could chose how much (2, 3, or 4 portions), and how spicy you want it. Literally burnt from two days earlier, we went for just a little spicy. The food was once again very good, full of flavor and texture, although a bit strange to find parts of the chicken never served in Sweden. Not to humans, at least. This short trip to Seoul made us want to go back. Nice people, good food, nice and interesting surroundings. Definitely worth a trip. Or two. Or three. In a few days we are going to Seoul, South Korea on a four days trip. As our thoughts have been, we are going to make a long-weekend trip almost once a month. But, it is not just getting to the airport and leave. Things need to be planned, at least a little, to be able to use these few days well in a new city and a new country. When to go? We already have a schedule for this - what months are best for what cities? This narrows the decision, this time we choose Seoul. How to get there? Flying mostly, but mainland China is reachable by train. We fly to Seoul so it is out on the net to search for the best flight tickets. There are a lot of airline carriers to choose from and this time we had arrival and departure times as the first priority - leave Hong Kong in the morning and return in the afternoon. This gives us half Friday, Saturday, Sunday and half Monday in Seoul. We choose Cathay Pacific to Seoul. Where to stay? Ooops, no idea what part of Seoul is The place to be in. So, ask around, google it and make a pick. 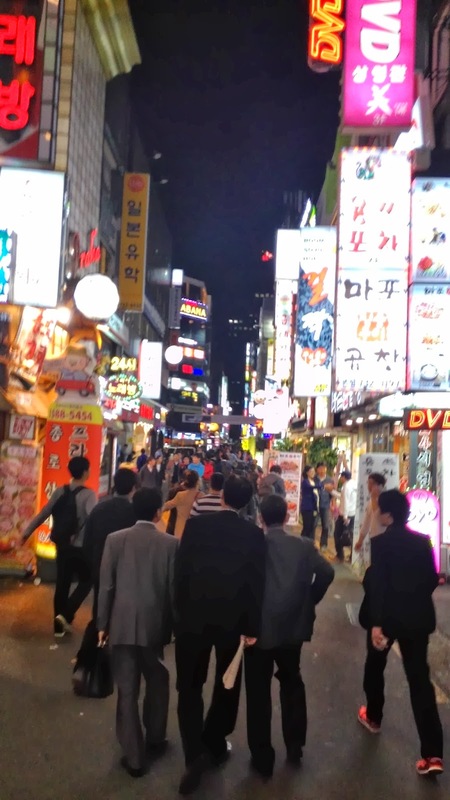 We choose to stay in the vicinity of Myeongdong as this is a good area for tourists. Lots of places to see, eat at, and shop in. What to do? As Seoul is completely new to us so we have no idea. Once again we use google. But, the amount of information is enormous. After a few hours and finding a few hot spots we give up. We do have something planned at least. The rest will come when we are there. Where to eat? Korean food can be very good but they have some strange dishes. They eat octopus that still is alive. I think we skip that. But there are a lot of dishes with very good produce, meat, tofu, seafood, vegetables, and of course kimchi with everything. Their national dessert, binju, seems to have an upswing with lots of variants. And I guess we have to try their national spirit, soju, as well. Need to knows! Weather - check! Cooler than in Hong Kong so at least a sweater for Yvonne. Electricity, currency, how to get from the airport, how the metro works, when are the stores open, do we need a visa? An endless list of things to find out. So, there are a lot to discover but this is part of the trip and (almost) as fun. We are so looking forward to this. No pictures yet, but hopefully when we are back.